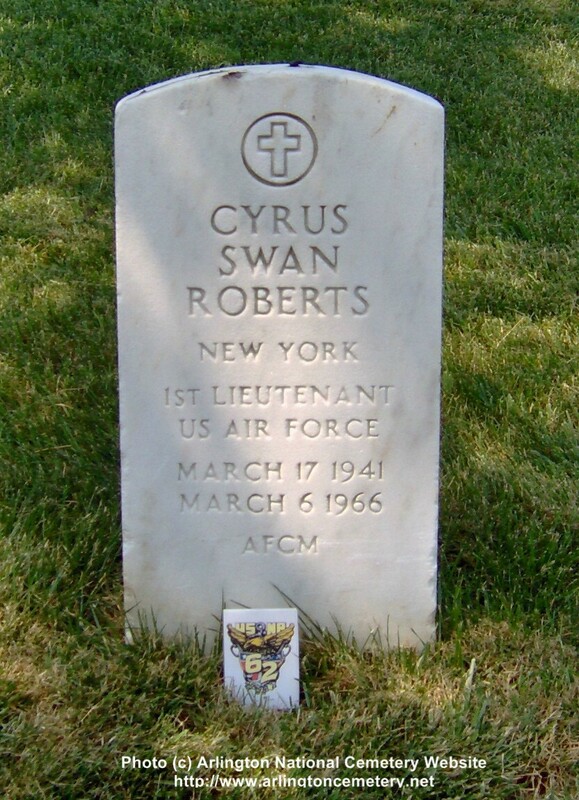 NOTE: Cyrus Swan Roberts IV, First Lieutenant, United States Air Force, a graduate of the United States Military Academy, was killed in the Vietnam War. His burial site is being investigated. I have attached a photo of Cy's marker ( 2-3749A) at Arlington. I have the following from a previous publication. Lieutenant Cyrus S. Roberts IV, USAF, was killed in a military aircraft accident in Southeast Asia on 6 March 1966. Services and interment were held in Arlington National Cemetery. Lieutenant Roberts, who was born in New York City, was graduated from the Naval Academy in 1962. He is survived by his widow, Katherine H. Roberts, and daughter, Katherine D., of 315 East 80th Street, New York City: his mother, Mrs. Katherine K. Roberts of New York, and his father, Mr. Cyrus S. Roberts, III, of Long Beach, California. Your note incorrectly shows him a graduate of West Point. He was in fact a classmate of mine at Annapolis. From the photo, it would appear that his burial site is pretty clear. It is alone on the side of a hill in section 2. Thanks for all your efforts on the web site. NOTE: See other relatives buried at Arlington National Cemetery: Cyrus Swan Roberts, Brigadier General, United States Army and Charles Duval Roberts, Brigadier General, United States Army.